NYPD Muslim Spy Scandal Grows with Newly Revealed Plan to Target Shiite Mosques | Democracy Now! spiritual leader at the Mosque of Islamic Brotherhood and president of the Islamic Leadership Council of New York. AP: "Document shows NYPD eyed Shiites based on religion"
JUAN GONZALEZ: A new report by the Associated Press has revealed the New York Police Department recommended increasing surveillance of the Shiite Muslim community in 2006 as tensions between the United States and Iran escalated. The report is based on a series of interviews and a confidential 10-page police document recently obtained by AP. The May 2006 NYPD intelligence report is called “U.S.-Iran Conflict: The Threat to New York City,” and it makes several recommendations, including increasing monitoring of specific Shiite mosques and centers in New York and surrounding areas. The report is just the latest revelation by the Associated Press into secret intelligence operations set up by the New York Police Department following the September 11th attacks targeting Muslim neighborhoods. Hundreds of mosques and Muslim student groups were investigated, and dozens were infiltrated. Police monitored and catalogued daily life in Muslim communities, from where people ate and shopped to where they worked and prayed. According to the AP, many of these operations were built with help from the CIA, which is prohibited from spying on Americans. On Thursday, a coalition of Muslim and civil rights organizations reiterated their call for the immediate resignation of New York City Police Department Commissioner Ray Kelly. The groups released a press statement saying such acts of surveillance undermine trust between the Muslim community and the NYPD. These measures are merely the latest in the well-documented history of NYPD’s targeting of communities of color through discriminatory policing practices. AMY GOODMAN: The AP report comes on the heels of another controversy surrounding the New York Police Department and the Muslim community: the Police Department’s admission that it aired an anti-Muslim film, The Third Jihad, to nearly 1,500 officers during training. To talk more about the report, we go to Washington, D.C., to speak with Associated Press reporter Matt Apuzzo. He co-wrote the piece, “Document Shows NYPD Eyed Shiites Based on Religion.” Earlier this week, Matt Apuzzo and his colleagues at the AP were named finalists for the 2012 Goldsmith Prize for Investigative Reporting for their ongoing reporting on the New York Police Department’s intelligence unit. So, Matt, welcome to Democracy Now! Tell us what you found in this latest report you did. Tell us exactly what this document is. MATT APUZZO: Well, this document is a secret—an NYPD secret memo prepared for Police Commissioner Ray Kelly by the Intelligence Division. This is, you know, the unit that was set up and beefed up after 9/11 to basically root out terrorists and be the eyes and ears in the city for the NYPD. What the document does is it says, you know, there are ongoing tensions between the U.S. and Iran, and if those tensions were to escalate, what are the threats to New York, and what can we be doing now to mitigate those threats and try to get ahead of the curve? That type of analysis, that goal, is the kind of analysis that, frankly, every intelligence agency does and everybody, you know, expects should be done. But what happens is, is they then say, “OK, so this is the threat,” and they go through and they say, “This is the demographics of our city.” You know, they make note of the number of Iranians who live in the Northeast, and then they talk a little bit about, you know, the makeup of Iran and the political nature of Iran, and then they list a bunch of recommendations. And the recommendations go from the obvious—we should try to recruit more sources who speak Farsi—to things like, as you mentioned at the top of the show, we need to be increasing our intelligence gathering at Shiite mosques. Now, I mean, it’s very hard to read that document as saying anything other than you’re doing religious profiling. I mean, what you’re saying, what that document says, is, “We should look at all Shiite mosques, because we need to know about Iranian terrorists.” And so, they might be there, so—you know, Iran is a Shiite country. Iran sponsors terrorism. We have Shiites in the United States. That’s where we should be, where the Shiites are. And that was really striking for us, because, you know, Mayor Michael Bloomberg has said the NYPD doesn’t even consider religion in its policing. So, we’ve asked the Mayor if he still thinks that’s true, but his office had no comment. You know, Ray Kelly has said they only follow leads. But there are no leads at all in this document that suggests this is why we’re going into these mosques, this is why we’re spying on Shiite mosques here. There are no leads other than they’re Shiites. Ray Kelly kind of downplayed that at a news conference yesterday and said, “Well, it was a—this is a contingency plan. If hostilities were to break out between the U.S., this was our contingency plan.” You know, that was confusing to us, because it doesn’t say that anywhere in the document. There’s no indication of what would trigger this contingency plan. And also, what we haven’t been able to really get an answer for, if this is a good idea, if this is sensible police work, why wait? Why wait? Why make it a contingency plan? Why not just do it? And if it’s not a good idea, if it’s not something they should be doing, then why would you even have it as your contingency plan? If it’s not sensible, why would it be your contingency plan? So we haven’t been able to get answers to those questions. But, I mean, the document really has—the document has really, for us, been a little bit of a window into the analysis that drove a lot of the programs we’ve been reporting on for the last six months; the Demographics Unit, which monitors conversations in coffee shops and hookah bars and social clubs, you know, to the mosque crawlers that go to the mosques. We knew that this was going on. We had documents showing it was going on. For the first time now, we have documents, backed up by interviews, showing, well, this is why it was going on. And at least in this instance, you know, the logic wasn’t follow a lead, it was follow Muslims. JUAN GONZALEZ: And Matt, once again, the document shows the extraordinary reach of the New York Police Department. They’re talking not just about surveillance in New York City, but also of mosques up and down the Northeast. JUAN GONZALEZ: —basically conducting operations wherever it feels it needs to do so. MATT APUZZO: Right. And so, in this instance, they’re talking about suburban Philadelphia and West Hartford, Connecticut. I mean, those are the southernmost and northernmost reaches of the—you know, on the list, the mosques on the list. What’s interesting here is, you know, this is so far outside the New York Police Department’s actual physical jurisdiction, some of what they do they actually are able to pick up under federal jurisdiction, because this unit is technically part of a federal high-intensity drug trafficking task force, set up by—under the auspices of the federal government. So it’s interesting. At least some of these documents we’ve obtained are actually—you know, were actually done on federal computers. But we’ve not been able to get any answer from the Obama administration. The Justice Department wants nothing to do with this. You know, they don’t—they haven’t answered our questions for months on this about whether this is OK. I mean, we just want to know—the Obama administration has been really clear about where it comes down on what police departments and what the federal government should be doing as far as outreach to communities and how we should be, you know, building those bridges. They have not said whether—well, yeah, we want you doing that, but we also want you doing this stuff that the NYPD does. JUAN GONZALEZ: Matt, just quickly, even getting this document—the NYPD is notorious for resisting Freedom of Information requests. How difficult was it to get them to turn over this document? MATT APUZZO: Oh, they didn’t turn it over. I mean, you know, in the course of this reporting, we’ve received documents from a variety of sources, you know, who have done so, frankly, probably to some—with some risk to their careers, and lot of people inside the department. The majority of people who have been talking about this—you know, Ray Kelly has said repeatedly, this is disgruntled FBI guys. I mean, the FBI didn’t really even—didn’t even know about these programs. I mean, so we’ve been able—you know, we’ve been building these reports on dozens and dozens of interviews with people inside the Intelligence Division, you know, people with intimate knowledge of these programs, who’ve—you know, many of whom who say, “No, we’re not ashamed of this. This is the way you should be doing it,” and some of whom who say, “This is not what the police department should be doing.” And again, we’re just trying to get that discussion going. And frankly, I mean, here we are, six months after the first story came out, and we’re still talking about it. And, you know, we think it’s a topic worth talking about, and certainly a topic worth exploring. AMY GOODMAN: Matt Apuzzo, we have to break, but we’re going come back to this discussion. We’ll also be joined by a Harlem imam to talk about the effect of the release of the report on the surveillance on the Muslim community in New York. This is Democracy Now!, democracynow.org, The War and Peace Report. We’re speaking with Matt Apuzzo, the AP reporter, among the team who has broken the story of a New York Police Department report saying they would be surveilling the Muslim community. This is Democracy Now! Back in a minute. AMY GOODMAN: Matt Apuzzo is still with us, reporter for the Associated Press, co-author of the AP report called “Document Shows NYPD Eyed Shiites Based on Religion.” We are going to link to that at our website, democracynow.org. 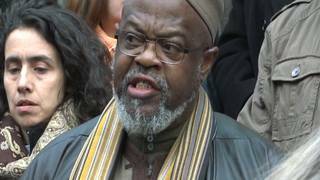 We’re also joined by Imam Talib Abdur-Rashid, spiritual leader at the Mosque of Islamic Brotherhood and a member of the Islamic Leadership Council of New York. Matt Apuzzo, I just wanted to go back to the issue of the CIA and the New York Police Department relationship. News recently, the CIA saying they did not approve this relationship, though a top official within the CIA, David Cohen, after September 11th, came to New York and worked high up in the—became one of the top officials in the New York Police Department. MATT APUZZO: Right. So, after 9/11, David Cohen, who was one of the top intelligence officers at the CIA, came to the NYPD as the head of intelligence, and one of the first things he did was in collaboration with George Tenet, who was the CIA director, arranged for another CIA officer, Larry Sanchez, to come to New York. Now, it is a very murky arrangement. So, George Tenet sent Larry Sanchez to New York as his personal representative. So he’s still on CIA payroll. He is still—you know, still has his CIA badge. He starts the morning at the CIA station, you know, reads all the intelligence, and then goes over to NYPD and shares it. And that is what, I think—you know, intelligence sharing is what is absolutely supposed to happen, and post-9/11, you know, that was the focus. But, I mean, what Larry also did was Larry was also the architect of a lot of these programs. I mean, you know, New York was trying to figure out how are we going to—how are we going to find these things? How to get the—you know, how are we going to these leads? How are we going to get these informants? You know, where are we going to put our undercovers? And Larry was able to bring a lot of the expertise. And a lot of the officers that we’ve interviewed, you know, said, Larry was invaluable in this, in helping us build these programs, reviewing our records. And now, that is what—that’s what we’ve sort of focused on, the CIA relationship. They also—CIA has also trained an NYPD detective at the Farm, which is the spy school in Virginia. And then, just most recently, there was another senior—one of the most senior CIA officers in the country went to New York on what the federal government called a “management sabbatical,” but what Ray Kelly said was “information sharing.” So, we don’t still really know what his job was there, but we do know it’s ending early, nine months into a one-year stint. And it sounds like, from what David Petraeus said before Congress yesterday, that that sort of relationship isn’t going to continue. They’re going to find some new way to collaborate and share information. But it doesn’t sound like they’re going to be sending anybody back. JUAN GONZALEZ: Well, I’d like to bring the imam into the conversation. Your reaction to this continued exposure of what the New York Police Department is doing in the Muslim community, not only in New York City, but up and down the East Coast? IMAM TALIB ABDUR-RASHID: Well, we’re not surprised at all. Those of us who are familiar with the history of the NYPD, we know that there has been a longstanding tension not just between the Muslim community, but between communities of peoples of color here in New York City. And we view these latest programs, the programs that are focused on Muslim New Yorkers, as being directly related to NYPD intelligence programs of the past, the Red Squads of the 1950s and '60s, you know, focused in on political activists, except now, instead of just focusing on the political community, they're focusing on our religious community. AMY GOODMAN: Have you experienced the surveillance at your mosque, at the Mosque of Islamic Brotherhood? And also, the fact that you’re the president of the Islamic Leadership group here in New York, what people are saying, other imams? IMAM TALIB ABDUR-RASHID: Yeah, other imams throughout the city, we are positive that they are on that list. We have lawyers in our community who have seen the list. And we know for a fact that there are mosques throughout the city that have been targeted under this program. JUAN GONZALEZ: Well, you know, one of the sentences in this report that the AP uncovered says, ”FBI officials have suspected that the Alavi Foundation is using its Islamic centers as a means of penetrating the Black Muslim community to recruit sympathizers,” the Alavi Foundation being an association that has connections with the Iranian government. JUAN GONZALEZ: This effort to paint the black community as being infiltrated by foreign forces? IMAM TALIB ABDUR-RASHID: Well, of course, that’s an old theme going all the way back to the 1930s. You know, government still doesn’t get it, that the African-American community is capable of its own analysis of problems, capable of organizing itself as a community. When one looks at that document, under “Ancestries of Interest,” which was one the NYPD documents, African Americans are the only American-born or indigenous group on that list. IMAM TALIB ABDUR-RASHID: And the whole premise is a fallacy. The African Americans, we do not have any kind of history of terrorist activity in America, in spite of the circumstances under which we came here in the first place. AMY GOODMAN: Matt Apuzzo, you are nodding your head. Talk more about that. MATT APUZZO: Yeah, yeah. So, one of the documents that we were able to obtain along the way was their “Ancestries of Interest.” And the imam is absolutely right. I mean, it’s 28 countries—almost all of them are Muslim countries—and the only—and then American Black Muslim. You know, there clearly is a concern or a viewpoint that the NYPD about Muslim converts and about African-American Muslims. You know, one of the programs we uncovered along the way was the name change program. The NYPD, basically, they data mine everybody in New York who changes their name. And if you change your name, if, you know, I’m Matt Apuzzo, and I change my name, and I take the last name Mohammed, I’m going to get looked at. And if I am—if the imam changes his name to Matt Apuzzo, he’s going to get looked at, because the concern is, well, is he trying to go undercover? Is he going to try to go—you know, is he going to try to obscure his identity? And the feeling on that was that, you know, oh, well, if somebody is taking a Muslim name, maybe they’re becoming more religious, they’re becoming, you know, potentially more violent. And if they’re Americanizing their name, you know, just as generations of immigrants have done, if they’re Americanizing their name, well then maybe that Muslim is trying to avoid scrutiny and try to blend in. And so, you’d get a background check. You’d get put in a police database. And depending on who was doing the analysis and at what time in the program this was, you might get a visit from the NYPD just to ask you about why you were changing your name. IMAM TALIB ABDUR-RASHID: You know, listening to this, this helps me to understand that one of the bases for this current activity is actually the 2007 NYPD report on so-called homegrown radicalization. And back then, the Muslim American Civil Liberties Coalition challenged many of the premises that are in that report as to how they identify, you know, Muslims who were being, quote-unquote, “radicalized.” And they fought the coalition then, those of us in the Muslim community, who were you’re saying to them, “This is not right. This gives the wrong impression.” They smugly dismissed our criticisms now. Now we find out that they actually built programs based on these false premises in the first place. JUAN GONZALEZ: And Matt, I’d like to ask you just briefly—am I wrong, or have I been witnessing a increasing sort of division between the FBI and the New York Police Department? Several times, the New York Police Department has arrested so-called terrorist suspects, where the FBI has almost disdained them as real entrapment efforts, not real terrorism cases. Do you see a growing division between the FBI and the NYPD on these matters? MATT APUZZO: Well, there is a rift, but, I mean, I actually think it gets a little bit—I mean, the rift between the NYPD and FBI is kind of a oversimplified thing. I mean, there is a rift between the FBI and the NYPD’s Intelligence Division, but I actually think, you know, the most—this most recent case, the Pimentel case, I mean, you know, I think that that might be a case of just some bruised egos on both sides. If the NYPD wants to bring a case that the FBI doesn’t want to bring a case on, I mean, certainly the NYPD can bring a case. Now, the FBI, if they didn’t want the case to be brought, they didn’t bring it. I mean, if the FBI decides they want to—I mean, the NYPD decides they want to bring it, I mean, that in and of itself I don’t think is indicative of the rift. I mean, certainly there is a division between the Intel Division and the FBI in New York. But, you know, to the imam’s point, which is, I think, fascinating, about the idea of building these programs and how—and what is effective policing, I mean, the Department of Homeland Security—I mean, Janet Napolitano and, you know, Barack Obama have talked about this very issue, globally or nationally, about how we’re going to—about what are best practices for policing. And they’re very eager to talk about it, as long as you don’t talk about New York. I mean, we have asked for months to try to talk to them about the NYPD’s programs, which federal money finances, but, I mean, we can’t get the Homeland Security Department to say, “Yeah, we are—we’re for this. This is what we want. We want this done in every city,” or, “No, we’re actually against that. We don’t want it done in any city, or actually, we only want it done in New York.” It does seem weird, right? I mean if it’s good practice, if this is good law enforcement, it should be replicated and put everywhere. And if it’s not good law enforcement, then we certainly don’t want it done in the city that is the focus of—the biggest focus of international terrorism. IMAM TALIB ABDUR-RASHID: Yes. You know, Amy and Juan, just a few weeks ago, there was—you did a program here on Democracy Now! in which you were highlighting the continued militarization of the police force in New York City and other major cities. And this is another example. A few years ago, under Mayor David Dinkins, he implemented a policy and approach that was called “community policing.” And, of course, under the Giuliani administration, they moved away from community policing, and now here we are in the past decade under Mayor Bloomberg and Ray Kelly. Ray Kelly has moved the NYPD completely away from community policing. And they are in fact running the NYPD as—like it’s the private army of Mayor Bloomberg. AMY GOODMAN: You’re having a protest today, Imam Rashid, down at Foley Square here in New York City. AMY GOODMAN: And you’re calling for the resignation of the Police Commissioner, Ray Kelly? IMAM TALIB ABDUR-RASHID: Absolutely, the Police Commissioner and his spokesman, Paul Browne. They have continuously misled and lied to New Yorkers, generally, and Muslim New Yorkers, in particular. They’ve been caught in their lies. And the taxpayers of New York are not paying them to lie to us about what they’re doing, so we’re calling for their resignation. AMY GOODMAN: We want to thank you very much for being with us. IMAM TALIB ABDUR-RASHID: Thank you. AMY GOODMAN: —called “Document Shows NYPD Eyed Shiites Based on Religion.” And Imam Talib Abdur-Rashid of the Mosque of Islamic Brotherhood and president of the Islamic Leadership Council of New York. He’ll be at Foley Square today at 3:00 in New York City—that’s the courts area of New York—leading the protest.